Wtih facilities all over the United States and other countries, Rudolph Foods has opportunities to impact many communities. Check out the great ways our Rudolph Foods family is making an impact on our world. John Rudolph has a passion for Lima, Ohio where he resides and where RFC was founded. Over the years he has been involved with fund raising and development efforts for various community projects. Including: Lima Streetscape project in the 1970’s, Lima/Allen County Civic and Convention Center in the 1980’s, New Lima Area Family YMCA and Ottawa River Bike Path in the 1990’s, and most recently restoration of an 1880’s historic landmark to house a new Business Services Center for the Lima Area Chamber Foundation. It opened in April, 2009. His vision and project list will out live him. Fortunately, he has passed down his passion for involvement to improve communities to his family and other associates. Southern Recipe spent the 2nd year in a row in Delaware at the annual Science Channel’s annual Punkin Chunkin. We sponsored a Dayton area pumpkin chucking team and got to watch them launch pumpkins over 2,000 feet! The Pork Rind Heritage Festival offers family fun, entertainment, and Rudolph Foods’ famous popped pork rinds. The two day event includes live entertainment, corn hole tournaments, a 5K Run, and much more for the whole family. The festival is just a few miles from our corporate office in Harrod, Ohio. Each year Rudolph Foods donates our famous recipe pork rinds that are popped fresh during the festival for participants to enjoy. This year, the Pork Rind Heritage Festival celebrated its 22nd Anniversary. The event takes place every year during the second weekend of June. See Photos of the Rudolph Food's Pork Rind Heritage Festival. 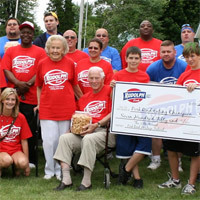 The picture above shows the 2009 Major League Eater’s Pork Rind Eating Champion "Buffalo" Jim Reeves from Boston, NY (in blue behind check) with John & Mary Rudolph along with other Rudolph friends and family. © Rudolph Foods Company, Inc. since 1955.